If I had to pick a favorite shoe I would hands down pick flats. They are comfortable, they're cute, and they work for any season! 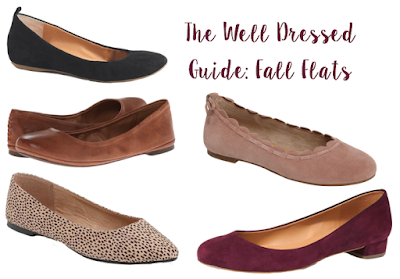 But fall is definitely my favorite time to wear flats, so I thought I would share some of my favorites for this time of year. I've been absolutely loving all the suede flats this season and am looking forward to adding a few more pairs to my closet. And you can't go wrong with a fun leopard or classic brown pair. I'm always looking for more flats to add to my collection, so let me know your favorites in the comments!